Mint Off Card: Star Trek The Gorn by Mego Corp.
Thread: Mint Off Card: Star Trek The Gorn by Mego Corp.
A new episode of “Mego Museum Mint off Card”, where we de-card a new Retro Figure and let you explore what’s inside. Our subject this week is the Gorn from the classic Star Trek episode “Arena” by Mego Corp, available at Target stores right now! 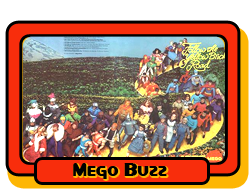 We also do a bonus segment on Mego’s history with the Gorn as well as the Mego fan community, it's a nice story. Great video and background. It's a terrific figure--I like the tweaks Mego is doing with the Trek reissues. Great video Brian! Love all the 'Mint Off Card' Reviews! Really enjoyed this one! I hope we get every single McDunsell possible Brian. I love the Gorn so much I bought 2 of the EMCE versions, years ago. I now have the fantastic, new, red phaser capable Mego one, and cannot wait for more Mego Trek. Great video, love the Gorn and info, very nicely done, thanks for sharing. Love the Gorn. Not even a Trek guy, but I bought one anyway. It’s the only Trek I own. That was so AWESOME! Man, thinking James and Dave Mc really takes me back...I miss those days. Buy Hey, We're still getting McDunsell's still!! Great review for a great figure. Looking forward to his Sarek and Amanda 2 pack.